Hope you Bold owners out there managed to snag AT&T's BlackBerry Bold visual voicemail software update while it lasted, because an internal memo leaked to BGR says it's been pulled due to compatibility problems with "network enhancements being deployed." That sounds to us like there's an issue with either those 850MHz 3G rollouts or whatever black magic Ma Bell's doing to get iPhone MMS up and running, but either way, it's one more fire for AT&T's engineers to put out while its customers sit around waiting. Update: AT&T just sent us their official word on the matter -- check it out after the break. 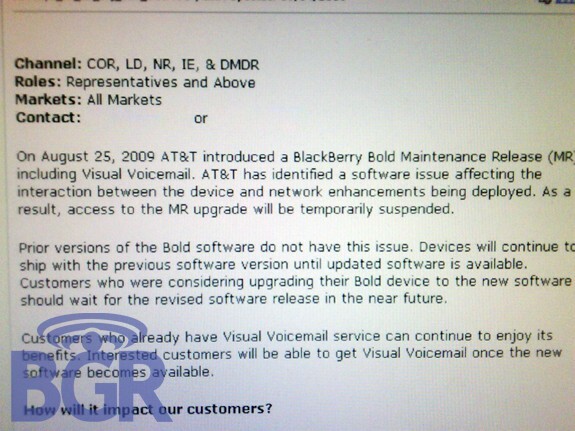 AT&T yanks BlackBerry Bold visual voicemail software update originally appeared on Engadget Mobile on Sat, 05 Sep 2009 16:20:00 EST. Please see our terms for use of feeds.